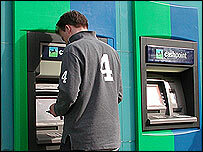 Lloyds TSB has won a second county court case against a customer trying to reclaim overdraft charges. A case was dismissed by a judge at Lancaster county court on 11 May, four days before a ruling in Birmingham against a claim from Kevin Berwick. A builder from Lancaster, Julian Rudd, had tried to recoup £3,000 in overdraft charges and interest. Lloyds TSB did not turn up to argue its case, but the judge decided Mr Rudd had failed to state an adequate claim. Judge Forrester, who heard the case, said: "It is ordered that the particulars of claim are struck out as disclosing no reasonable grounds for bringing the claim set out as a coherent set of facts, which if true, disclose a legally recognisable claim against the defendant." Mr Rudd, who did not attend the hearing either, said afterwards that he thought his paperwork might have been inadequate. "I have a feeling that if we had reworded it, we might have had a shout," he said. The man who lost in Birmingham county court on 15 May, Kevin Berwick, has decided not to appeal against the decision, but to go to the Financial Ombudsman Service instead. A QC's opinion suggested that he had failed because he had not put forward some important evidence, such as the exact terms and conditions of his account with Lloyds TSB. As a result of the lack of this evidence, the QC advised that the rest of the case was not important and did not deal with any legal principle. As the rules for appeals in civil cases do not allow fresh evidence to be brought forward, Mr Berwick has been advised that there would be no benefit in appealing. Marc Gander of the Consumer Action Group said: "These cases, in Lancaster and Birmingham, show that people have to be more careful about their preparation." Despite these two victories for Lloyds TSB, some courts around the country are becoming more annoyed at the standard bank tactic of failing to turn up in court to defend a claim, even though a written defence has been submitted. It has come to light that a district judge at Rhyl county court in Denbighshire has written to Lloyds TSB telling it to submit, by 5 June, a list of all the cases it has taken to trial and all the ones it has settled. The order of Judge Thomas says that if it fails to do this, "the court... is considering striking out the defence as an abuse of process on the basis that the defendant has settled all previous claims of this nature." At Worcester county court, a judge recently told one bank charges claimant, David Huckerby, in whose favour he had just ruled, that this was the 50th time that a bank - also Lloyds TSB - had failed to turn up before him and he was now getting "thoroughly fed up". These are the latest among a growing number of judicial criticisms. In recent months, similar comments have been made by judges in Lincoln, Leeds, Bristol and even the Mercantile Court in London, a branch of the High Court. There, Judge Mackie openly accused some banks of behaving unreasonably, by procrastinating when customers tried to sue them for the return of overdraft charges. Even though Lloyds TSB is, so far, the only bank to win such a case in any court, it is still continuing to settle cases against it. The campaigning website Moneysavingexpert records 24 separate examples of the bank agreeing to demands for refunds. All have come since 15 May, when news of the Birmingham judgement was revealed exclusively by the BBC News website. A Lloyds TSB spokeswoman told the BBC on Tuesday: "We do settle some cases, because we don't like to see our customers in court." Moneysavingexpert also records four cases in which the Clydesdale/Yorkshire bank has settled claims out of court since 15 May, even though it is telling claimants that from now on, it will rely on the Birmingham judgement in its own defence. However, a spokesman for that bank refused to say whether or not it would now instruct its solicitors to turn up in court to argue its case in front of a judge, or merely continue to rely on a written defence, in the hope that this would be persuasive.